It's cooked by frying up curry powder and flour. The side menu come with milk and salad. You can try this curries at these restaurants below. Wood Island's specialty is using large and fresh carrots and potatoes that have been produced in Yokosuka. They put extra care into maintaining the shape of the vegetables in the process. 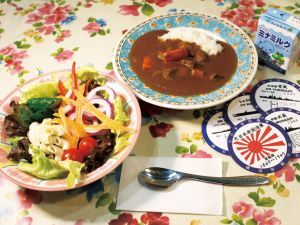 Their curry roux contains a lot of vegetable extract that brings out the flavor of the meat and vegetables. 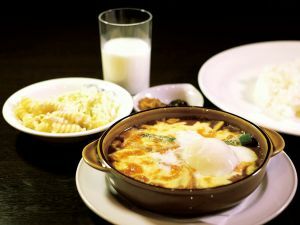 Yaki Curry(grilled curry) is their specialty. One of their unique aspects is the curry being served in large amounts inside our British retro-styled stew pot!